Noise Cut-off (Ultra Isolation) Transformer cuts off noise, so your machine can perform with musical perfection. All the types of electrical noises, predominantly common mode noises can be eliminated by Ultra Isolation Transformers. Since it isolates primary and secondary or separates neutral to ground bond on the secondary side, can be used to create separately derived source to combat current loops. The Ultra Isolation Transformers are available in different levels of noise attenuation capabilities. The most commonly used are 100 & 120 dB. The coupling capacitance between primary and secondary is direct 1:1 relationship with dB levels. Some of the graphs herewith indicate different types of electrical noises observed in typical Engineering Industries & successfully eliminated. 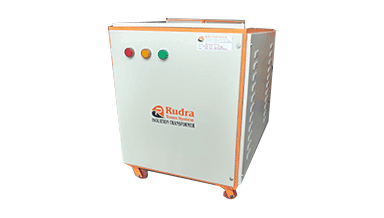 Rudra Trans System is a renowned name in the market offering premium quality of Power Conditioning and Power Protection Equipments like Servo Stabilizers, Isolation Transformers, UIT, Online UPS, Home Inverter etc.